My information packet for law school arrived! Earlier than I expected, I now have all the course info, my schedule, orientation info, an email address, a student ID and a book list. They sent me this cute little personalized flash drive with everything on it and I can reuse it later! I love freebies! I also love that I can finally start buying books, planning my schedule, emailing my teachers, making my folders, reading ahead.... can you tell my OCD has hit overdrive??? OCD or not, I am so excited to be on this road. 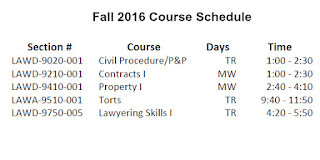 Seeing my schedule and getting the first email from my advisor really helped this to feel real- I am actually going to Law School in a month and a half. I am slightly terrified, super excited and mostly just ready to take this step in my career path. I found out about orientation. We have a two-day orientation before classes start. 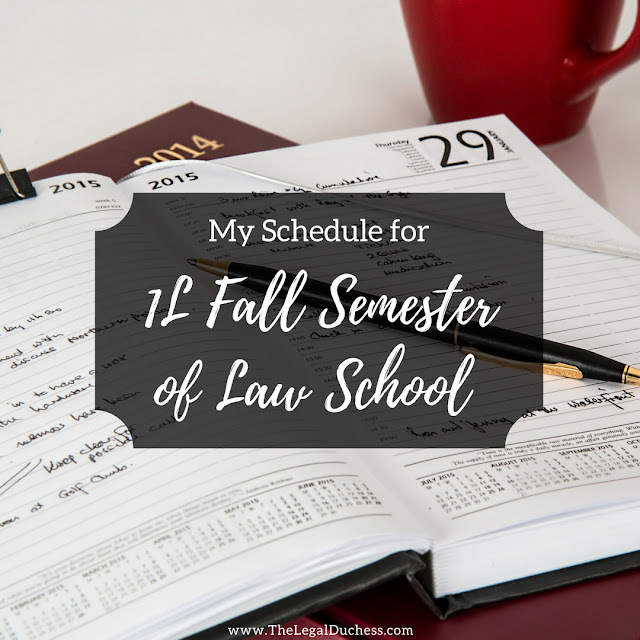 I was pleased to see they offer sessions for spouses to help them understand the life of a law student and what it may be like to live with one. I think this will be very beneficial for my (almost) husband and is just a thoughtful touch. We also have info sessions on case briefing, studying, reading, etc. to help us prepare and be successful. There are a lot of mixers to get to know our fellow students which is good because I want to make some friends to commiserate with. They also have free food at almost everything soooo that is a huge plus in my book. After getting my schedule, I immediately jumped on ratemyprofessor.com to check out the reviews. All but one of my professors were listed and to my complete amazement THEY ALL HAD GOOD REVIEWS!!! They all had high, smiley face ratings and reviews saying they truly care about the students and are good, understandable professors who really care about you. I don't know if I just got lucky or what but I think that is a great omen. It is also a testament to the school I chose- they offer wonderful instruction and professors who care and want to teach you. I still have one surprise professor but 4/5 is pretty good in my book! Another exciting thing is that my earliest class in 9:40am! I am not in any way a morning person so that is SO exciting! I like to study late at night and sleep in so my schedule thankfully allows for that habit to continue. I only have class until 5:50pm at the latest as well which allows me to get home in time to make dinner for my husband (in 25 days) and let my puppies out and take them to the park. Overall, I am excited and very happy with my schedule and all the information I received. 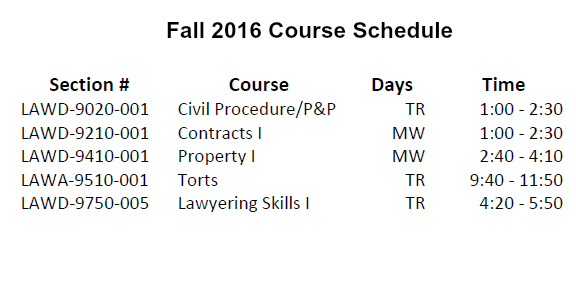 Law school is coming quick and I am feeling kinda ready... and kinda terrified.